Technology companies have a unique advantage over other businesses, and it’s called the network effect. Each new user who joins a platform adds value to everyone already on it. Facebook would be boring if you were the only one on it. Google would be useless if websites opted out of its indexing services. Amazon would lose substantial clout if 3rd party sellers refused to participate. 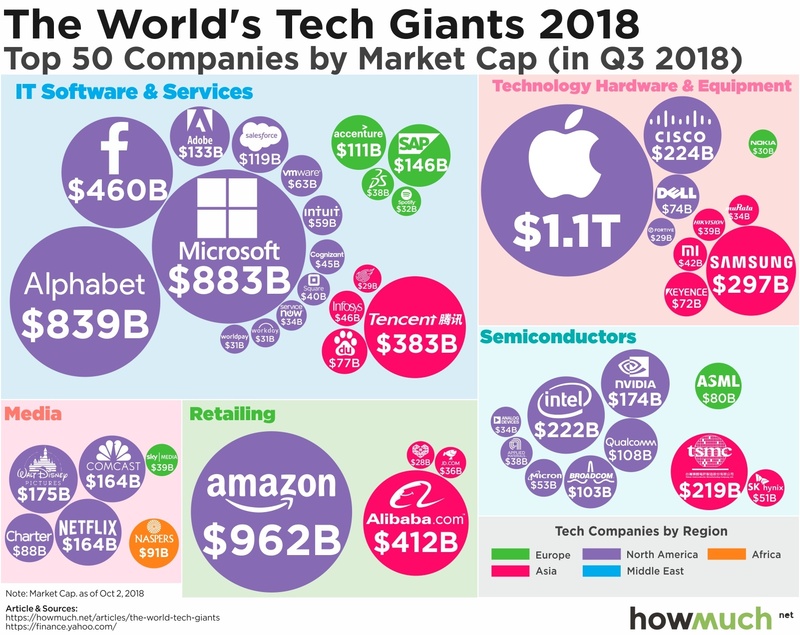 The network effect results in a few key companies with outsized control over a market, and indeed when you look at the industries dominated by the top 50 tech giants, the network effect is on full display. We determined the world’s top 50 tech giants based on market cap using a ranking from Forbes, which we sliced a few different ways. The color of each bubble corresponds to the geographic region the company is from, and the size represents market cap as of October 2018. But here’s where things get interesting. Each group represents the five specific industries within the top 50 companies, like IT Software & Service, Technology Hardware & Equipment, Media, Retailing and Semiconductors. This approach lets you easily and quickly see which companies and regions dominate the global market. The first and most obvious takeaway from both our visualization and the above list is that the US dominates the global technology sector. The biggest companies come from North America (purple), and most are headquartered in Silicon Valley, CA. Second place clearly goes to China (red), which boasts several companies in the top 50, but none are even half the size of the world’s leaders like Apple, Amazon and Microsoft. Meanwhile, there are a few companies from Europe (green), and only 1 from the Africa (orange) and zero from the Middle East (light blue). There is a similar top-heavy distribution of market cap within industries too, with only a few companies dominating the rest. Let’s start in the top left and move clockwise around the visual. Microsoft ($883B) and Alphabet ($839B) are the only two to crack $500B. Facebook ($460B) deserves special mention as the only true social media behemoth to make the list, but otherwise the size of every other company pales in comparison. The same is true in technology hardware & equipment. It’s Apple’s universe ($1.1T), and then there’s everyone else. Samsung ($297B), perhaps the only real competitor to Apple’s iPhone, is the obvious standout from South Korea, but Apple is almost 4 times as big. The semiconductor industry is likewise controlled by a few companies like Intel ($222B), tsmc ($219B) and nvidia ($174B). At first glance, retailing and media appear to be much more evenly distributed than they actually are. Consider how Amazon has so dominated the market that its North American competitors are so small, they don’t even make it onto the list of top 50 companies. Amazon is so big, there is literally no other company in sight. Will the world of tech companies continue to be dominated by only a few players? Lots of analysts think Alibaba has a lot more room to grow, perhaps as much as 50% more this year, suggesting that once a company captures a big piece of the market, it will only continue to expand. And yet other factors like the spread of 5G wireless connectivity present serious challenges to incumbents. See the investments made by Samsung. In fact, the biggest threat to these companies might not be the changing economy or developments in technology, but rumblings that antitrust legislation is needed to break up “big tech” monopolies.